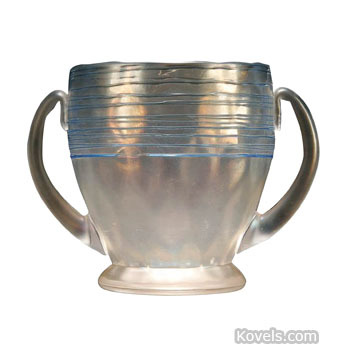 Verre de soie glass was first made by Frederick Carder at the Steuben Glass Works from about 1905 to 1930. It is an iridescent glass of soft white or very, very pale green. The name means "glass of silk," and it does resemble silk. 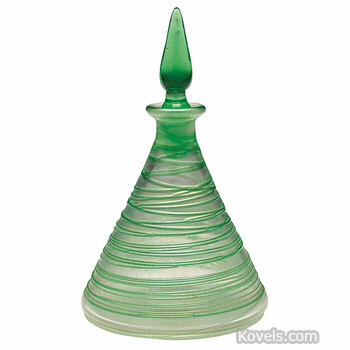 Other factories have made verre de soie, and some of the English examples were made of different colors. Verre de soie is an art glass and is not related to the iridescent, pressed, white carnival glass mistakenly called by its name. The Verre de Soie, Cluthra, Cinta, and Aurene were lines made by the Steuben Glass Works. Related pieces may be found in the Steuben category.